“Digital Influence” is very much a hot topic of conversation. Who has influence? How is influence defined? Can you really score influence? These are just a few of the questions often subject to passionate debate. As we continue to explore the digital influence landscape, we turned to Social: IRL sponsor Appinions, an opinions-based influence measurement tool for brands and agencies, to get their perspectives. How do you define digital influence? At Appinions, we consider two forms of online influence: personal influence, which is one persons’ influence sphere (and measured by tools such as Klout), and contextual influence. We believe that it’s the latter, contextual influence, that is most useful for brands to consider. Appinions considers “influence” to be opinion based; that is, once you express an opinion, it is compelling and resonant enough to elicit action/response from others in the form of a quote, reference, link or re-tweet. The power to elicit some kind of action based on one’s opinions. How is your approach to measuring influence different to more popular score-based systems? Appinions is very different from Klout, Peerindex and other personal influence measurement tools in that we only consider contextual influence. Rather than returning a singular, unvarying score for each influencer, we develop influence measurement in the context of a topic which is customized and highly specific to a brand’s particular strategy. Our contextual influence measurement is multi-dimensional and across both social and traditional networks, focusing on the actual opinions and actions elicited, as well as the qualitative weight of where each action was published. What do you think is the biggest misconception about the current approach to influencer marketing? Too much emphasis is placed on personal influence – those scores which indicate one person’s individual strength as an influencer in general. Until recently, however, that’s all that most people were aware of. Contextual influence is going to be far more valuable to brands in the long run. Additionally, influence happens on and off-line; a personal influence score based on a couple of social networks is far less accurate and representative than contextual influence developed across news, blogs, tweets, forums and TV. Appinions offers a separate toolset focusing specifically on the “Influencer Gap.” Could explain what this is and why you put so much focus on this? The Influencer Gap gives brands an accurate and disciplined tool to measure success by understanding its Share of Influence, which is increasingly critical for today’s marketers. Specially, who should be speaking about you but isn’t? This allows brands to focus on developing thoughtful strategy and outreach programs that will increase the reach and engagement those brands can have with the people that influence their market the most. Having existing brand advocates speak more about you is one goal but finding those influencers that don’t speak about you and get them into a conversation, is even more valuable in the long run. What would be the top five tips you would share for re-thinking and better understanding how we look at digital influence? 1) Don’t confuse personal influence with contextual influence. While personal influence has its place for individuals and brands as one dimension of influence measurement, only contextual influence will help a brand understand who is influential in the topic or category they are trying to measure. 2) Invest in focused WOM aimed at those people that count, which will have a direct impact on a business’s bottom line over time. 3) Don’t fixate on the influencers talking about your brand today, focus on those that aren’t as that’s how you grow your brand’s awareness. 4) Perception is reality, don’t ignore the criticisms or misconceptions discussed about your brand. Translate them into insights for your marketing strategy or product development cycles. 5) Influencers respond best if you deliver a relevant message to them. Reflect on their points of views as you communicate with them – that should translate into higher levels of engagement on their end. Want to learn more about Influence Measurement Tools? 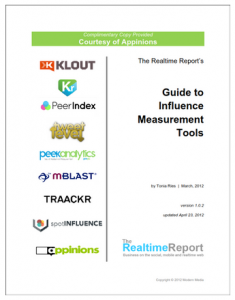 For a limited time, you can download the Realtime Report’s Guide to Influence Measurement Tools for free (registration required), courtesy of Appinions. The report is typically a $20 download at the realtimereport.com. Appinions is an opinions-powered platform that makes it easy to identify, analyze, monitor and engage with influencers. Not only that, but Appinions enables researchers and publishers to automatically mine, analyze, and summarize opinion to gain insight into what people and organizations are saying, thinking and feeling. Based on a decade of research at Cornell University, the platform features an extensive database that includes millions of opinions extracted from blogs, Twitter, Facebook, forums, newspaper and magazine articles, and radio and television transcripts. The platform not only focuses on the influencers creating content but the influencers attracting the most attention. This lets Appinions provide a unique and unmatched view of the influencer landscape. Services include the Appinions Influencer Exchange that lets public relations agencies and brands quickly and effectively discover influencers based on any topic, brand, issue or person, and the Influencer Gap that helps brands perform topic based analysis in order to effectively establish relationships and engage with these key influencers.